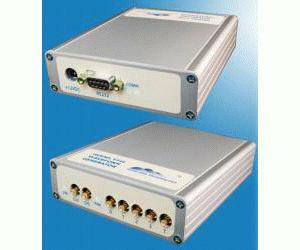 The T344 is a compact 4-channel, 32 MHz waveform generator. It incorporates four DDS waveform synthesizers that may be used independently or synchronously to produce polyphase signals. Waveforms include sine, triangle, sawtooth, noise, and precision square/PWM outputs. User-loaded arbitrary waveforms may be generated.